This is one case, I’m sorry to say, in which you had to be there. But let’s see if I can do it justice with some numbers: 10,000 pumpkins that weigh a total of 200,000 pounds; 1,000 volunteers; 120,000 visitors; and 20,000 beneficiaries. 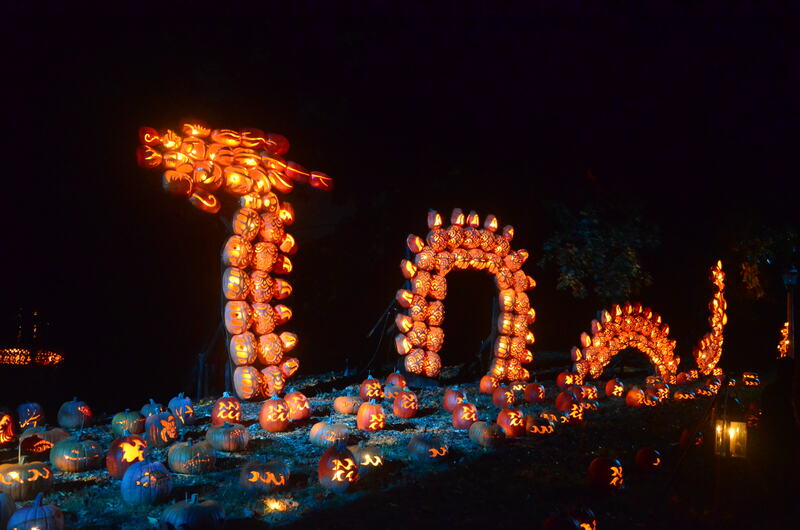 Intricately carved pumpkins at the 11th annual Great Jack O’Lantern Blaze are created under the direction of artist and sculptor Michael Natiello. 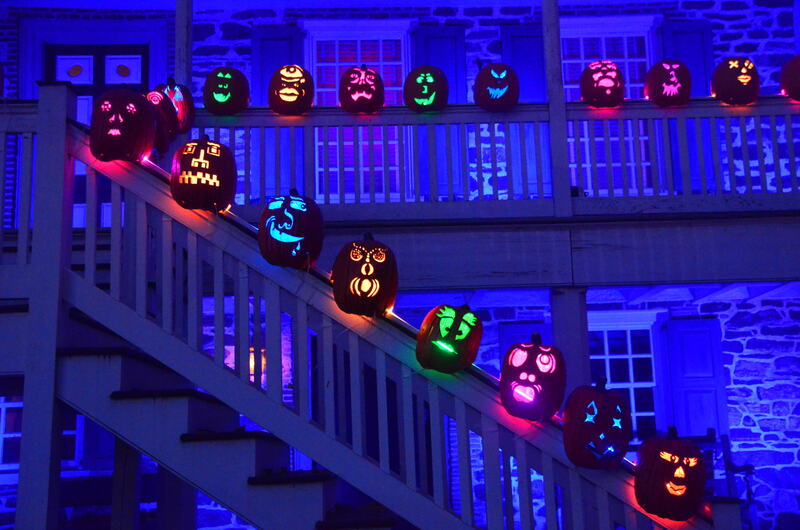 Carvers create 10,000 pumpkins during the seven-week extravaganza. These are the numbers that define the annual Great Jack O’Lantern Blaze, probably the largest pumpkin extravaganza on the planet. 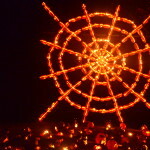 The Blaze, as it is commonly called, has been wowing visitors for 11 autumns. It is staged on the grounds of the pre-Revolutionary Van Cortlandt Manor in the Hudson Valley town of Croton-on-Hudson. Yes, Halloween has passed, but if you are looking for a place to celebrate autumn 2016 in a big way, consider a visit to New York’s Hudson Valley. 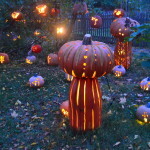 It would be difficult to find an area that goes all out so intensely for the season and Halloween. There are multiple events hosted by Historic Hudson Valley which are centered on stories and legends that are woven into the area’s history. Judging by the crowds on a recent brisk October night, the event is more popular than ever. 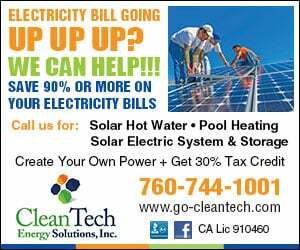 Infants, teenagers, parents, grandparents and people of every age and background file past bigger-than-life prehistoric monsters, circus trains, beehives and jack-in-the-boxes, all constructed of pumpkins of all shapes and sizes. 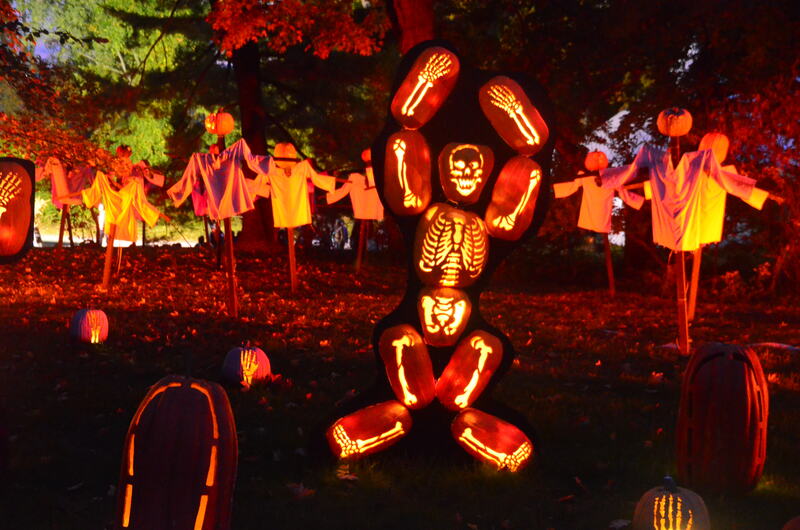 Pumpkin skeletons perform with backup ghosts at The Blaze in New York’s Hudson Valley. More than 120,000 visitors are expected to attend the seven-week event, orchestrated by Historic Hudson Valley, an organization dedicated to teaching students about the area’s history area and preserving historic properties. 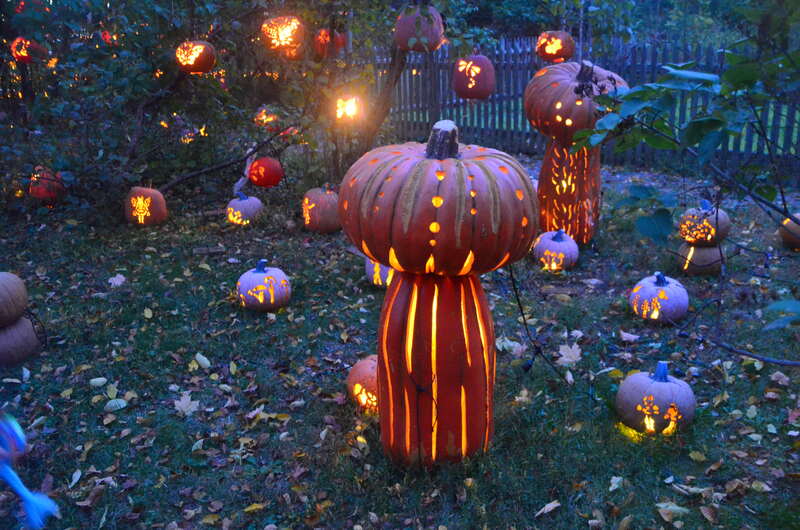 Some pumpkins are lighted with LED bulbs; others with candles. It takes volunteers three hours each night to illuminate the latter. It’s difficult to take it all in; we don’t want to miss a detail. A few of the pumpkins are of the mortal variety — that is, you and I could duplicate them – but the majority are truly works of art. The intricate designs carved into pumpkin flesh look as if they have been cut by lasers wielded by modern-day Michaelangelos. In fact, they are the work of 20 master carvers who work under artist and sculptor Michael Natiello, the 41-year-old creative director of The Blaze. 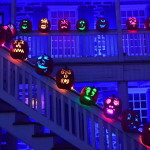 Pumpkins of every mood line the stairway and porch at the historic Van Cortlandt Manor in Croton-on-Hudson, N.Y., where visitors can learn what life was like in the years just after the Revolutionary War. He told the New York Times that he likes to hang out during the event and listen to visitors’ comments. “Like if somebody says they see a sheep skeleton instead of a dinosaur, I’m not going to correct them,” he said. 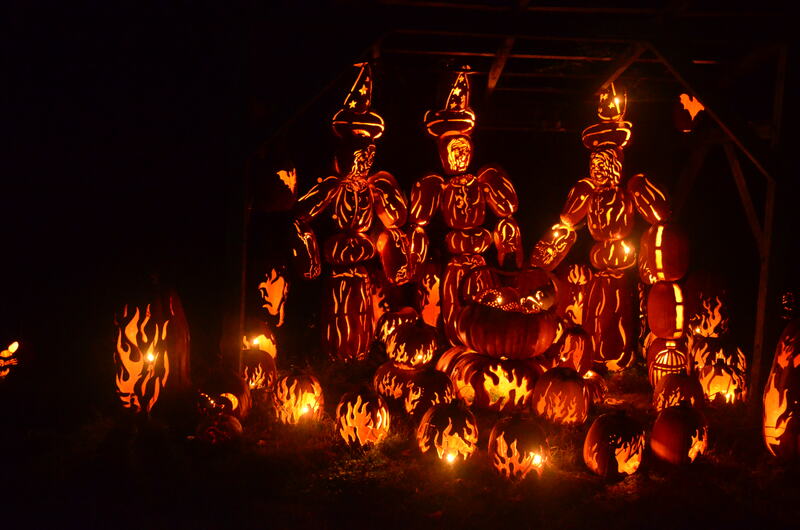 Natiello has been in charge of The Blaze since its inception in 2005, when it featured only 2,500 pumpkins. For more information: visit hudsonvalley.org and travelhudsonvalley.com/. 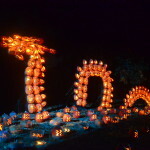 A ferocious serpent made of pumpkins rides through an imaginary sea at The Great Jack O’Lantern Blaze in Croton-on-Hudson, N.Y, in the Hudson Valley. 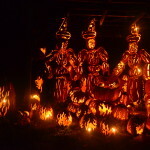 Three witches, constructed of hand-carved pumpkins, attend their caldron during the annual Great Jack O’Lantern Blaze at Croton-on-Hudson, N.Y. 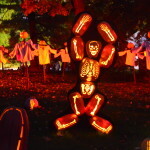 The Blaze is the premier autumn/Halloween event in the Hudson Valley and the Sleepy Hollow area, which takes advantage of its history to draw thousands of visitors during this time of year. 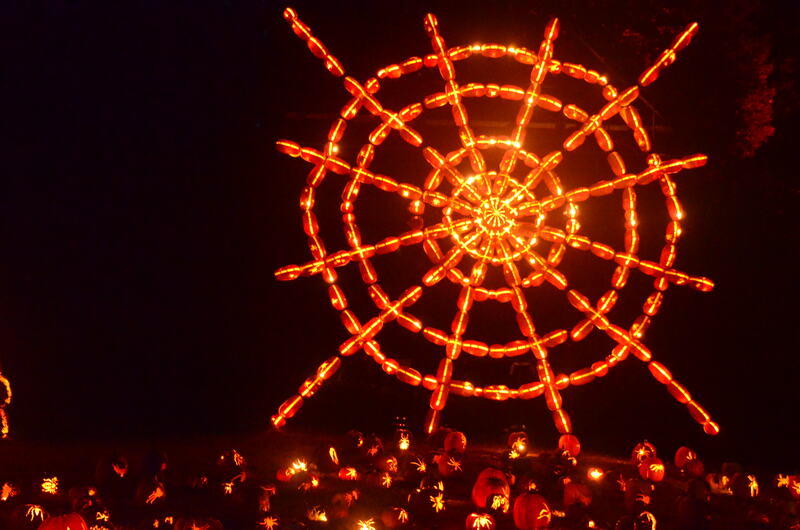 A giant spider web, constructed completely of pumpkins, mesmerizes visitors at The Blaze. Spectators come from 50 states to see the event, which has been staged in the Hudson Valley since 2005. Profits from the annual event are used to educate New York State students about the area’s history.